For decades, the Islamic Revolutionary Guard Corps (IRCG) has been inflating the role of the exiled Iranian political-militant organization Mojahedin-e Khalqm’s (MEK) in every popular protest. The IRCG uses this as a smokescreen tactic to mask the widespread popularity of regime change in Iran and the real popular demand: a constitutional monarchy and democracy. These two propositions are both institutionally opposed by the MEK and the IRGC. In May, British Foreign Secretary Boris Johnson said in parliament that Britain shouldn’t pursue regime change in Iran because then the IRGC, and especially its Quds Force Commander General Qasem Suleimani, would take control of power in Iran. Johnson’s claim was criticized and derided by many Iranian opposition groups and even British Members of Parliament. However, IRCG’s take-over is exactly what could happen to Iran’s Islamic regime in the near future. Since 1997, Iran’s Islamic regime has employed a successful tactic that they call “social engineering,” which in popular Iranian language is sometimes a synonym for “choosing between bad and worse.” The regime uses social engineering to persuade people to take part in elections and vote for reformists instead of conservatives under the guise of political and economic change. By using this tactic, the regime can show the world that Iran is a democracy where Iranians can decide their own future and the future of their country. In fact, the structure of Iran’s theo-political system is too rigid to allow real democratic change. Only one person, Supreme Leader Ayatollah Ali Khamenei, supported by his henchman organization the IRGC, has the power to decide on domestic and international policies. Despite the nuclear deal, which the Islamic regime tried to present to the public as a successful case of its foreign relations skills, Khamenei and the IRGC never toned down their hostility towards the U.S. and Israel. They rather strategically increased their military presence in Syria and in November 2017, changed their main objective from defeating Islamic State to defeating Israel by establishing the 313th Division of IRGC-Quds Force in Syria. A side effect of these costly activities was instability in Iran’s economy which led Iranian and foreign investors to withdraw almost $30 billion (equalling 75 percent of Iran’s oil export in 2017) worth of capital from Iran in 2017 alone. It led to several negative results, including the devaluation of the Iranian currency, price hikes, and bankruptcy of various companies and industries. The economic stagnation brought people to the streets of Iran’s second most populous city Mashhad on December 28 last year, and led to widespread protests across more than hundred other cities, including the capital Tehran, Kermanshah, Ahwaz, Isfahan, Shiraz, Hamedan, Qazvin, and Doroud within just seven days. Unlike the 2009 demonstrations, the working class demanded regime change during these rallies from the get-go. Not surprisingly, the regime employed extremely aggressive measures to stop the protest, such as mass arrests, the killing or assassinating of protesters, and torturing detainees to death. 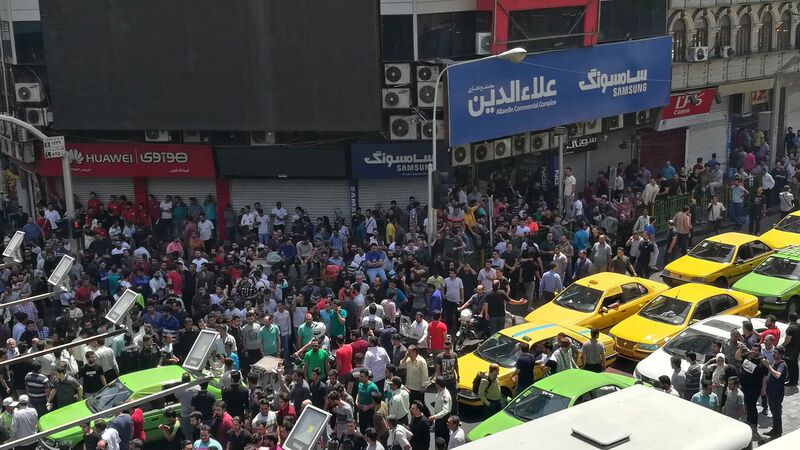 The regime’s security forces including Basij and the IRGC, especially their Tharallah HQ in Tehran, managed to put a (temporary) end to the protests two weeks after they started. Quickly after that, the regime faced yet another security threat, in the form of Iranian women’s rights activists (the decried “Western feminist movement”), who had waged peaceful protests against the compulsory Islamic hijab. Nationwide strikes by factory workers and Iranian truck drivers followed, which paralyzed Iran’s oil industry in some provinces for several days and forced the regime to utilize the IRGC’s trucks to haul fuel around the country. It was not only a matter of time before the U.S. government’s decision to withdraw from the Iran nuclear deal and the resumption of sanctions caused even larger financial problems for Tehran including the significant Iranian currency devaluation on Sunday 24 June which already has resulted eruption of a rare but nationwide protest strike in Grand Bazaars of Tehran, Tabriz, Shiraz, Kermanshah, Mashhad and Qeshm on Monday through which thousands of Iranians hold demonstrations in streets of Tehran in which they chanted slogans against the regime authorities. This, in turn, will lead to larger and more widespread protests of all classes of the Iranian society, forcing the regime to impose a state of emergency and transfer power entirely to the IRGC. On Sunday, during a meeting of IRGC war veterans and generals in Fars Province, special military advisor for Supreme Leader Khamenei, IRGC General Yahya Rahim Safavi, clearly underscored the importance of governing Iran with the help of a political system where IRGC and Supreme Leader will be the only decision-makers. Established by Khamenei’s predecessor Ayatollah Sayyid Ruhollah Mūsavi Khomeini, who founded Iran’s Islamic regime in 1979, the IRGC is now the most powerful organization in Iran after the Supreme Leader. The IRGC not only has twice the annual budget of Iran’s regular armed forces, but also five times less personnel and military equipment. The IRGC has been dominating Iran’s economy through more than hundreds of shell companies from oil, maritime, and aviation industries to construction, telecommunication and defense industries. Current Supreme Leader Khamenei used the IRGC to violently suppress civil unrests, which followed the 2009 presidential election protests. He subsequently awarded the IRGC with special privileges, which helped the group to increase its penetration of the economy and political system. Hundreds of IRGC’s active and reserve members became parliamentarians, provincial authorities, or CEOs of governmental organizations and important industrial companies. This not only secured the IRGC’s interests but also protected the regime and the Islamic revolution from the danger of political and financial collapse through circumventing sanctions in various fields from oil to aviation industry. Only a few days before U.S. President Donald J. Trump’s decision to abandon the nuclear deal, representatives of the Iranian government, as well as Khamenei’s adviser Ali Akbar Velayati, met former U.S. Secretary of State John Kerry in Paris. According to a U.S. State Department official who spoke with the author on condition of anonymity, representatives of President Hassan Rouhani seemed to have warned the European governments about their upcoming plan to transfer full power to the conservatives (the IRGC, to be more specific), shall the U.S. attempt to pursue regime change in Iran. So, maybe it was no coincidence that only three days later, British Foreign Secretary Johnson made his stark announcement, followed by U.S. Secretary of State Mike Pompeo‘s comment that regime change was not a U.S. objective in dealings with Iran. Despite those statements, signs of upcoming nationwide protests and strikes with the ultimate goal of removing the Islamic regime and establishing a secular democratic system can be widely seen in Iran. On April 23, opposition online news service Amad News conducted an online survey of 147,606 (out of 1.5 million) members of its Telegram channel, who managed to bypass government filters. The outlet asked them what they wanted to see after a regime change in Iran: just a new regime under the leadership of the reformists or the establishment of a completely new system. Up to 59 percent of the respondents see Reza Pahlavi, son of the last Iranian king Mohammad Reza Shah Pahlavi, as a leader for regime change, while just 2 percent voted for the return of Mohammad Khatami, the leader of the reformist movement within a new Islamic republic. To protect the so-called “Islamic revolution” and its collapse, the House of Khamenei is expected to increase the IRCG’s power and allow the group to take over the entire political system. An IRGC commander, most likely current IRGC-Quds Force commander Soleimani, will be appointed as the next president, while the country will be run by a group of action-oriented “non-conservative” (as they call themselves) IRGC Generals. The role of the supreme leadership will gradually become ceremonial, especially after Khamenei’s death. Due to Soleimani’s role in forming and commanding Shia militias in the war against Islamic State in Iraq and Syria, the IRGC-Quds Force commander has become a popular and charismatic character among the supporters of the regime, including members of the IRGC and Basij militia and even among the reformists inside and outside the country. Soleimani is also a popular figure among the Shia communities in the region. While Iran’s reformists hardly form the majority of the population, the regime will nevertheless need their cooperation, or at least their indifference, during any transition of power to the IRGC. To justify brutal suppression of serious protests in the future and the subsequent transfer of power to IRGC, Iran’s Islamic regime has started employing an old but still practical psychological tactic to gain support for the IRGC and its security forces. This includes linking the IRCG to exiled political-militant organization MEK or the National Council of Resistance of Iran, an Iranian political organization based in France, an unpopular and undemocratic cult-like opposition group. By employing this technique, the IRCG ignores the fact that Iranians had chanted slogans against the regime’s policy for supporting Lebanese and Palestinian militia groups and in favor of the Pahlavi family. On December 31, 2017, the IRGC-affiliated Tasnim News Agency posted a screenshot of the MEK leader’s tweet, claiming she supported and even organized riots in Iran. On January 3, IRGC Commander in Chief, General Mohammad Ali Jafari, claimed on Tasnim News that the MEK trained the majority of the protesters. A week later, member of the regime’s Expediency Council Gholam Reza Aghazadeh repeated baseless claims that the MEK had organized the riots. The IRGC later organized counter-protests to break the morale of the protesters and to increase that of its supporters, especially the security forces. Personnel of the IRGC and their family members, as well as active members of Basij, took part in the counter-protests. During these demonstrations, IRGC’s commanders and representatives of Khamenei gave speeches and linked all the protests to the MEK, totally ignoring the fact that demonstrations had been formed spontaneously by people through social media, where the majority of the protesters chanted slogans in support of Pahlavi. The slogan first appeared in Mashhad on December 28, but it spread to a dozen other cities in the next few days. In many cases, the protesters chanted “Prince Crown, where are you? Please help us.” No slogans were heard in support of the MEK, which proves that the protests of December and January were linked neither to the MEK nor the NCRI. The latter still opposes the Pahlavi family and is proud of taking part in overthrowing the Shah during the 1979 Islamic revolution, which often happened with the use of deadly force, including against American citizens working in Iran at the time. Secondly, Iranians widely criticized the regime’s policies of spending the country’s national resources to support Palestinian militant groups. It started in Mashhad on December 28, when people chanted “Leave Palestine and care about us.” Later protesters chanted “Not for Gaza, not for Lebanon, I will only sacrifice my life for Iran” all over the country. One fundamental part of the MEK’s ideology is based on supporting the liberation of Palestine through armed conflict. The MEK established contact with the Palestinian Liberation Organization (PLO) and many of its founding members, including Masoud Rajavi, who has been trained by the PLO in Jordan and Lebanon in early 1970s. The MEK even took part in the 1973 Arab-Israeli war. The MEK has spent thousands of U.S. dollars to bribe American politicians to politically support the group, according to CBS News. The U.S. government and especially President Trump have yet to support the MEK, a testament to the fact that no sign of Iranian popular support for this group was spotted during the recent protests. However, the IRGC and Iran’s Islamic regime are still trying to claim that the U.S. government is widely supporting the MEK. However, the release of imprisoned MKO members to empower the group and radicalize the protests in Iran will not lead to a repeat of the Syrian civil war. It won’t be possible due to the fact that thousands of MEK members were killed during Operation “Eternal Light” in 1988. Even more of them perished during the second Persian Gulf War, when their camps were bombed by the United States and Royal Air Force in 2003. The fact that MKO has less than 20 members left in prisons would play a role too. Nevertheless, IRGC will continue to try to benefit from its MEK-centric propaganda by showing authorities and the regime supporters that Iranian protests are linked to the unpopular group, so that it can justify the brutal nationwide crackdown on any civil unrest followed by the complete seizure of power by IRGC. Book Author, Freelance Military Aviation Historian.